It might be tough to say that a team is in need of something when they are sitting at the top of the division standings -- which is currently the case for the Canadiens. However, the Tampa Bay Lightning have equalled Montreal's 46 points and the Detroit Red Wings and Toronto Maple Leafs are also in striking distance with 45 and 43 points respectively. For the Canadiens to separate themselves from the pack in the Atlantic, it may come down to a simple equation: they don't allow a lot of goals, ranking sixth at 2.37 per game, but they also aren't exactly an offensive juggernaut, ranking 19th in the NHL at 2.60 goals-for per game. On the surface at least, that doesn't seem to leave much wiggle room for error. 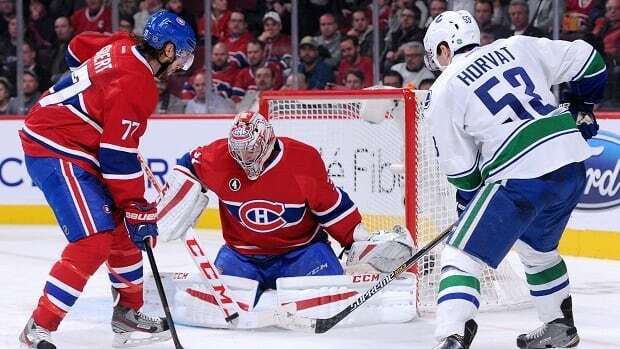 Carey Price appears to be doing all he can. His 2.23 goals-against-average is good for eighth in the league and would easily be the best mark of his career if it holds up. Price's save percentage of .926 is also impressive, especially considering he has faced the second most shots among goaltenders this season. Simply put: it would be nice if the Canadiens could find a way to ease the burden on Price. In some ways, the Leafs are in a similar situation to the Canadiens, in that they have also leaned heavily on their goalies at times to cover up other shortcomings. No one is going to argue that the Leafs need to score more goals as they score a league-best 3.31 per game and have 118 in total. A major knock on the Leafs has to do with a style of play that sees them get out-shot by a wide margin almost every game. Tuesday's win over the Dallas Stars was a prime example of this. The Leafs blanked the Stars 4-0 despite being out-shot 43-26 and were beneficiaries of a strong performance by Jonathan Bernier. The chances of the Leafs changing their style of play seems slim at this point, so they better hope their offensive production doesn't dip or go into a prolonged slump and that Bernier and James Reimer are up for doing headstands every night. The Jets are currently occupying the first wild card spot in the Western Conference and would face the Chicago Blackhawks in the first round if the playoffs started today. Paul Maurice has received a lot of credit and garnered some coach-of-the-year consideration for guiding a group that has battled injuries all season, particularly on the blueline. Winnipeg is in fourth place in the Central Division with 43 points, but only five points separate them from the division-leading Blackhawks. What's also encouraging is that the Jets are 6-3-1 over their last 10 games, including a 5-1 win in Chicago on Tuesday. If Maurice and the Jets can continue to hold down the fort over the next six weeks or so, it will be interesting to see what they can do when the likes of Zach Bogosian, Jacob Trouba and Mark Stuart return to the lineup. The Canucks went through a tough stretch from Nov. 28 to Dec. 9 in which they played seven-consecutive games on the road. They lost the last three games on that trip and returned home to drop two more before recovering to defeat the Flames in OT and the Coyotes in a 7-1 blowout. Vancouver will set out for a two-game trip to California before returning home to play five in a row at Rogers Arena. Hopefully the Canucks can use that stretch of games to create some breathing room in what is a very bunched together Pacific Division. After a surprising start to the season, the Flames fell back to earth with a recent eight-game winless streak that finally ended with a 4-3 victory over the Kings on Monday. However, it wasn't as if the Flames were getting blown out or outworked during the slide. In fact, five of those losses were by just one goal. Calgary also caught a break to the extent that the Canucks and Kings did not play particularly well during the same period. Event still, the Kings managed to climb over the Flames both in the division and for the second wild card spot. The Flames may be in tough as the more experienced teams above them seem poised to finish out the season strong. Two of Calgary's next three games are against the Oilers, so that might be a good place to start regaining some ground in the standings. The Senators appear to be floating in the dreaded territory of not being good enough to make the playoffs, but also not being bad enough to position themselves for a top three pick in the draft. Bryan Murray decided to shake things up when he fired Paul MacLean, but now it would seem that his attention has to turn to the composition of his roster. Unless there is optimism towards making a playoff push, the time has arrived to start thinking about next year and beyond. This period leading up to the trade deadline will be important for the Senators as far as establishing their needs going forward. If you are a fan of the Connor McDavid sweepstakes, then you are probably hoping that nothing changes for the Oilers this season. They are sitting last in the standings with just seven wins and 21 points. A lot has been made about the need to trade one of the core players, namely Taylor Hall, in return for more experience and depth. Finding that balance will be crucial for the Oilers in the long run as they will be adding yet another young, talented player through the draft prior to next season.